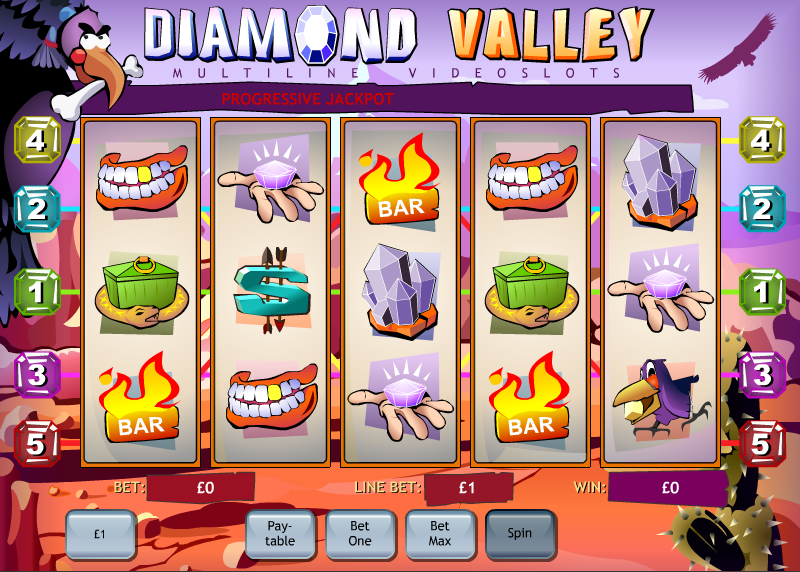 It’s well and truly back to basics when you play the Diamond Valley online slot from Playtech; at first glance it looks like a pretty cheap and cheerful affair and then at second glance that’s also the impression you get but there’s no getting away from the fact that this game features a progressive jackpot and who’s going to argue with that? 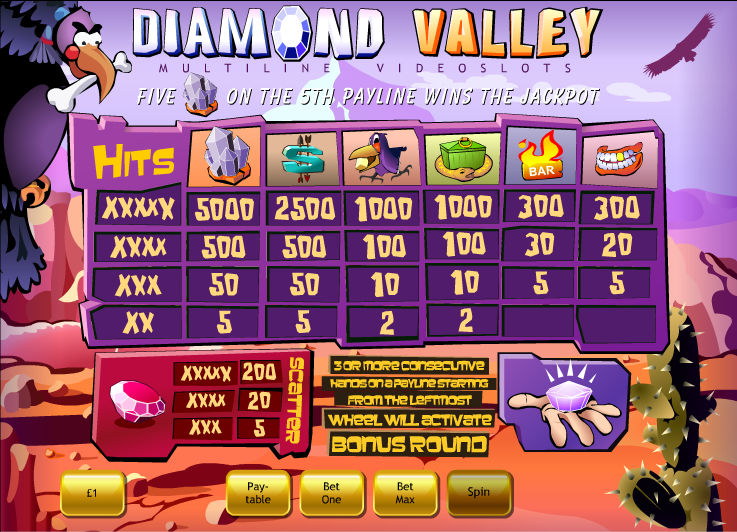 Diamond Valley offers us five reels and a mere five paylines so this game actually has some things in common with a classic three reel slot. You can’t change the number of paylines you play so there’s not much user interaction here. The symbols are a slightly odd mixture and we have a set of teeth, a burning bar, a snake coiled round a box, a purple bird, a dollar sign punctured with arrows and a giant diamond. If there’s a link between those things then we can’t find it. The scatter symbol is a red jewel and there’s hand holding a purple jewel which triggers the feature. Despite looking so graphically basic this slot does in fact feature a mini-game and it’s triggered by landing three or more of the hand-holding-the-jewel symbols starting from the leftmost reel. You’ll now get to play a short game where you have to decide which unfortunate person to rescue from the pit; the one you rescue will be worth a certain amount of money. This is probably the game’s biggest draw and there’s a constantly increasing jackpot which you can see scrolling along the top of the screen. The jackpot is won by landing five of the diamond symbols on payline five only and you’ll need to be playing with all five lines activated. A tip? Easy – you’re only here for the progressive jackpot so make sure you’re playing with all five paylines. Without the progressive jackpot this would be rather a dreary slot but that big prize makes it worth a go. After all, if you don’t buy a ticket for lottery you’ll never win!